The sprawling Figure Eight Island home for sale at 13 Oyster Catcher Road is marsh front with expansive views of the Intracoastal Waterway and the Atlantic Ocean. Sitting on 1.2 acres of manicured grounds with an old growth cedar canopy and natural wax myrtle privacy barrier, this 4 bedroom, 4 full and 2 half bath home has spectacular features inside and out. Figure Eight Island, N.C., December 2011 -- 13 Oyster Catcher Road in Figure Eight Island, North Carolina is listed for sale in the Wilmington area MLS by Hardee Hunt and Williams Real Estate Company (MLS# 470563). This stunning oceanfront home features expansive views from nearly each of the ten rooms as well as separate guest quarters, lush coastal grounds, and direct ocean access. The exterior of this Figure Eight Island estate showcases manicured coastal grounds with a canopy of old growth cedar, live oak, and holly trees. Wax myrtle trees create a natural privacy barrier and the exterior lighting package highlights the beauty of the landscaping and the home. The house flows easily between interior and exterior, with a custom open air lower level complete with tongue and groove wood ceiling, entertaining table, fish cleaning station, outdoor shower and changing room. A top level observation deck provides 360 degree panoramic views from ocean to sound. The interior of the home features a main living area filled with natural light via a plethora of windows. Sliding glass doors open to an oversized deck showcasing the amazing water views. Custom, built-in bench seating allows the residents to take advantage of the many windows and gorgeous views. Hardwood flooring and vaulted ceilings throughout the home enhance the light and spacious interior atmosphere. The kitchen at 13 Oyster Catcher Road in Figure Eight Island is modern, beautiful, spacious, and functional with high end stainless steel appliances and granite counter tops. The master suite and bath boast incredible sound views. The home also features a detached high end designer study and lounge with a wet bar above the 2 car garage. Hardee Hunt and Williams is a boutique Figure Eight Island Real Estate Company. This exclusive and highly desirable beach community within Wilmington, North Carolina generally has few homes up for sale and the agents at Hardee Hunt and Williams are uniquely positioned to help their clients acquire their dream home in this area. They also specialize in Wrightsville Beach real estate as well as homes for sale in Landfall. 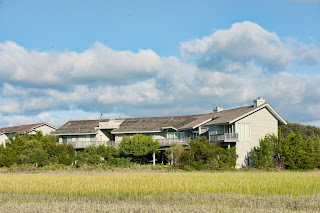 To learn more about the Figure Eight Island home featured here, visit http://www.13oystercatcherroad.com/. To learn more about Hardee Hunt and Williams Real Estate Company, visit http://www.hardeehuntandwilliams.com/.